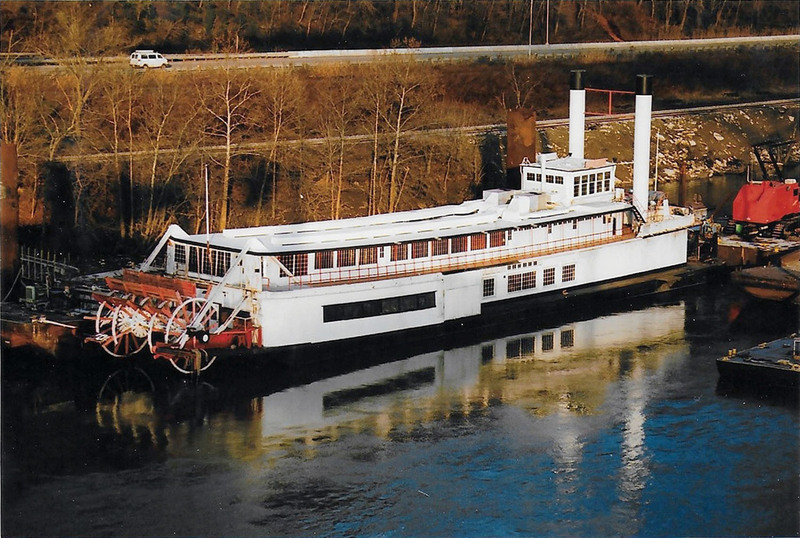 The Mike Fink, which has served as a steam towboat, a landing used for cruise boats and a restaurant boat, is back in service, soon to be a shop barge, thanks to Bellaire (Ohio) Harbor Service, which bought it at the end of last year from BB Riverboats. It had been idle since 2008. The Fink was built in 1936 by Dravo at Neville Island, Pa., for Campbell Transportation Company and named the John W. Hubbard. A steam towboat, it measured 172 by 35 feet and had condensing engines that had 16- and 32-inch cylinders with an 8-foot stroke. Its hull was extensively repaired about 10 years ago, Harrison said. Campbell sold it to The Ohio River Company in 1947, which renamed it the Charles Dorrance. After being decommissioned in 1957, the boat went through several ownership changes and was used as a landing boat before being purchased by Capt. John Beatty and converted to the Mike Fink floating restaurant. BB Riverboats bought it in 1977 and installed it at the company landing in Covington, Ky., where it became a popular dining place and longtime landmark. It ended up idled in Newport, Ky., at Riverboat Row up until being purchased by Bellaire Harbor. Bellaire Harbor Service provides harbor and fleeting services for 275 barges, has portable barge unloading, does towing and shifting, and offers marine repairs with two 1,000-ton drydocks, which will be served by the newly acquired shop barge.